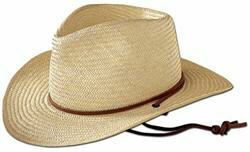 Ideal for full sun protection while gardening, working outdoors, or just to wear out on the town. This hat helps to shade your face and head from the sun. One size fits most. I feel like a regular cowgirl while working on my farm in this hat. It was cheap enough to not worry about messing it up while doing the dirty work of cleaning barns, gardening etc. And works great at keeping the sun off of my face.